The Prophet Muhammad (pbuh) was sent by Allah as a mercy to the worlds, so that we may be guided to Allah and achieve eternal happiness, just by following his example. The best part is, the life and practices of our beloved Prophet Muhammad (pbuh) are by their very nature extremely easy to implement! Apart from the above, following the sunnah has worldly benefits too: our Prophet (pbuh) was an incredibly productive person, so by following his sunnah, we automatically draw from his productivity techniques – thereby enhancing our own productivity. To follow the sunnah, you first need to know what it’s all about. This involves gaining knowledge – but make sure that the information you’re getting is authentic; since the benefit is in following the real sunnah, not the cultural and non-authentic religious practices that are sometimes rife in our communities. Regarding sources of authentic knowledge, you can learn from classes, articles, lectures, or any other well-trusted means. And if you find bite-size pieces more effective, you can ‘subscribe’ to the sunnah by making use of the many regular channels that are available. For example, many of today’s popular ulama (scholars) use social media to provide a continuous stream of beneficial knowledge – such as daily hadiths, Qur’anic reminders, and sunnah-based advice. If you use such technologies, seek out and subscribe to these scholars’ feeds. To go deeper into the topic, read books that are based on the authentic sources and find qualified teachers to explain what you read in order to confirm your understanding. Try to surround yourself with good people who will remind you of the sunnah. It’s good to be around those who verbally remind you, but it’s even better to be around those who actively practice the sunnah themselves. Humans are imitative creatures by nature, so merely being in the company of such good influences is bound to inspire you to follow their example. 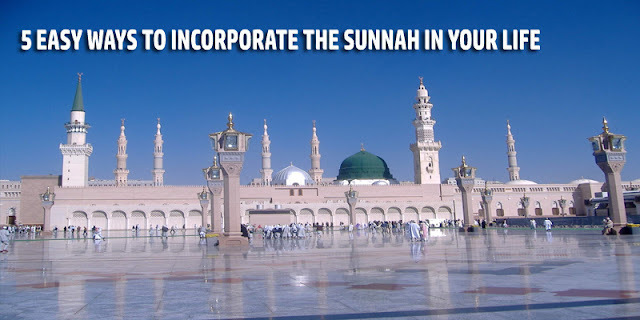 Identifying the sunnah: i.e. the action itself knowing what the reward for following the sunnah is finding an effective trigger that will remind you to do the action. Action: Making wudu before sleeping each night. Trigger: Identify the last thing you do before getting into bed – for example, brushing your teeth. Make that the trigger, telling yourself that from now on, after you brush your teeth, you’ll make wudu. There have been many great people in the history of humanity, and many of them have been taken as examples and role models by the people of their time and future generations. However, our Prophet (pbuh) is unique in that he is a flawless, timeless, universal role model: every other human had some flaws and negative sides to their character, but he (pbuh) is the only one whose every aspect of life can be taken as a positive example. He fulfilled a number of different roles in his life: he was the leader of the Muslim community, a husband, a father, a teacher, an army commander, a statesman and much more. Look at all his roles and find one those that relate to your own life – for example, if you’re a teacher, study the aspects of his seerah relating to his teaching methods. Take him as your ultimate role model in your job – learn his sunnahs as a teacher and try to incorporate that into your own teaching style. By making the sunnah very specific – instead of letting the whole body of it overwhelm you – you can find in our Prophet (pbuh) your ultimate role model for any important role you play in life. We humans are visual creatures, but in our modern societies, more often than not, what we see in the outside world calls us to vice and sin – like as the pornographic and materialistic advertisements all around us. One way of countering this is to use your sight in a beneficial way – by looking at that which reminds you of goodness, such as sunnahs you can implement. In your home or workplace, stick up visual reminders of the sunnahs you want to follow. These could be as simple as post-it notes, or as complex as Islamic infographics. Aside from these tips, there are many other practical ways to incorporate the sunnah into your life. Feel free to suggest some in the comments section, and if you plan to try out some of the advice given in this article, come back later and let us know how it’s working out for you. May Allah help us all to incorporate the sunnah into our lives so that we may earn His love, forgiveness, and ultimately, success in both this life and the next, Aameen!